Tennessee Politics are once again at the center of attention as Republican State Representative, Rick Womick continues to make disparaging remarks regarding Islam. His latest tirade included blasphemous statements that touted that, ALLAH is a “false God” and that the Holy Quran’ commands the killing of those who believe in any other faith other than Islam. Mr. Womick, 53, former fighter pilot and co-sponsor of a bill that would have made the practice of Islam illegal in the state of Tennessee, has joined the cadre of Republican presidential candidates, media pundits and anti-Sharia activists whose goal is to eradicate Islam in America. Terms such as “creeping Shariah” and “Population Jihad” are being used by this movement in a deliberate attempt to manipulate the minds of Americans. While clearly an organized calling for American Muslims to push for Shariah laws within our government does not exist, a pervasive, imaginary fear of Islamic law dominating the United States has permeated the media in an obvious attempt to cause hatred and revulsion of Islam and it’s adherents. “It is when you…demand that our Constitution take an exception to your beliefs, whether it be Sharia law or Nazism or white supremacy, it doesn’t make a difference” said Womick on an online video while clearly using the manipulative media tactic of falsely introducing an issue which will thereby cause the public to presume that there is an issue. Mr. Womick chose this past Veteran’s Day to strike yet another blow at Islam, as he stated during an anti-Shariah conference, that Muslims should not be allowed to serve in the military. “If they truly are a devout Muslim and follow the Quran and the Sunnah then I feel threatened because they are commanded to kill me”, said Womick in online vide. He also states that Muslim immigrants should be deported (based only on the fact of being Muslim and distrusted). These bristling statements became the source of insult to all Muslims who have served proudly in this country’s military. Estimates report that there are over 3,500 Muslims that currently serve in America’s armed forces. Thousands more have retired. As support for Mr. Womick and his rhetoric begins to snowball, many of the 6,000,000 Muslims that reside in the United States have become the target. Fifteen states have already considered placing various anti-Islamic laws on their books which would inherently prevent Muslims from practicing basic tenets of Islam. In addition to this, simple practices such as giving Zakaat (alms) could be misconstrued as combative behavior punishable by spending lengthy time in prison. While lawmakers and anti-Shariah activists might consider this a punishment that is fair for a Muslim, the question remains – should the same sentence should be prescribed for a non-Muslim who gives to their favorite charity? How far reaching are these proposed state laws? Or, are these laws discriminatory in nature as they will only be applied to Muslims, thereby violating the Constitution? The acts by these true ‘homegrown terrorists’ that seek to destroy the fabric of American culture that Muslims help create should be vehemently opposed by all Americans – Muslims and non-Muslims alike. 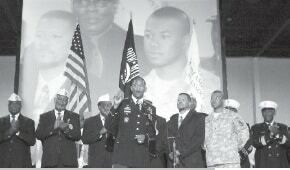 Muslim men and women who have served in our armed forces and/or in civilian capacities (such as police, fire chiefs and one of the first African-American paratroopers), were recognized in 2010 in Garden State Exhibit Center in Somerset, NJ.